1.) Udobuy Coat - Perfect winter staple, a must have that I really want this Christmas! 2.) Clarks Lace-up Booties - This winter I am so in love with lace up booties, and this pair is absolutely perfect. I would love some of these to pair with some cute chunky socks for those really cold winter days! 3.) Diptyque Honeysuckle Candle - Who doesn't love candles? They will always be on my wishlist... I can never have too many candles! 4.) French Connection Infinity Scarf - Love the color and the sparkles in this infinity scarf by French Connection. It could really dress up any outfit! 5.) J.Crew Colorblock Check Skirt - This skirt would be perfect paired with some black tights and lace-up booties! 7.) Oscar de la Renta Lace Tiered Chandelier Earrings - For the many Christmas parties I will be attending, these gold chandelier style earrings would look perfect with any Christmas dress! 8.) 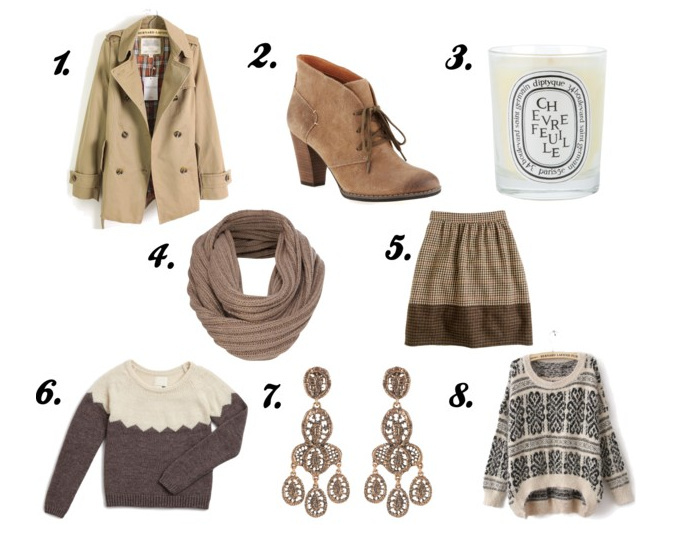 Sheinside Sweater - A nice, oversized, cozy sweater is always needed for cold winter days! Love the design on this one!